Long absent, but never truly gone. 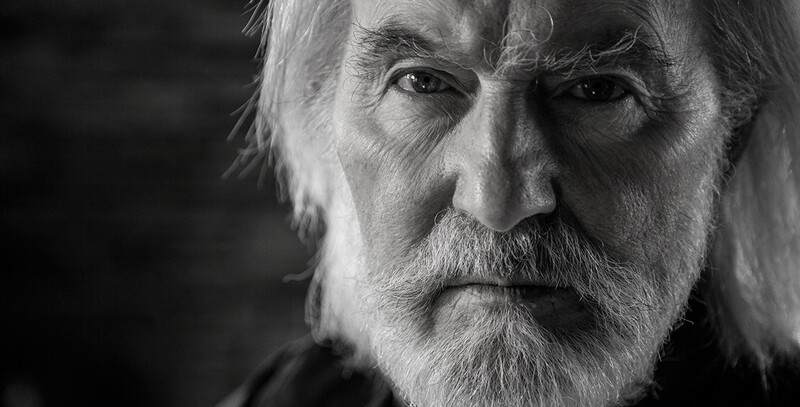 Roy Harper has long been one of those stalwart figures in the background of British music, working tirelessly often behind the scenes but imperceptibly influencing anyone who has ever come into contact with him or has heard his work. Having gained praise and tips of the hat from both contemporaries (Led Zeppelin, Bob Dylan, The Who) and subsequent generations of musicians (Jonathan Wilson, Joanna Newsom, Counting Crows), he has naturally gained a mythological status as something of a folk sage. His reclusion from recording after poor experiences with record companies has only fuelled this reputation, but recently he broke the thirteen year silence with Man-Myth, co-produced by present-day folk mythologist Jonathan Wilson. Tonight Harper will play the first of three intimate nights showcasing the new album, accompanied by Wilson and a small string and brass ensemble. If you are going to the Festival Hall in London tonight, I am very envious of you. For those of us not going though, we must content ourselves with the music. With that in mind I thought I’d draw attention to a gem off Man-Myth which has been coming into my mind during the morning drives past lines of trees shedding their golden leaves, ‘Time is Temporary’. Naturally for someone of his age and reputation Harper’s attention has turned to intense self-reflection, meditating on mortality and the discrepancies between self and perception, reality and expectation. Secluded here amongst delicate cello and banjo lines and buoyed up by a compelling guitar melody, Harper muses on love’s fleeting nature and the passing of time. However, with age comes perspective and rather than vocalising maudlin self-pity, Harper resigns himself, and possibly comes to terms with, the way things truly are. What makes the song truly poignant though is the tension Harper weaves in his poetic lyrics between trying to preserve the ‘perfect moment’ (“I have seen you for days here dipping your toes into the stream, / A vision of purity in an old pre-raphaelite dream”) and accepting that the passing of time is a fact of life (“I’d love you to stay here, but soon you’ll be gone / That’s just the way here in the sun”). However, as one of Harper’s earliest influences, John Keats, wrote in Endymion, “A thing of beauty is a joy for ever: / Its loveliness increases; it will never / Pass into nothingness; but still will keep / A bower quiet for us”. All moments are fleeting and temporary, but against the ravages of time we can commit it to memory and commemorate it in art, as Harper does here. The sparse core of guitar and voice, tastefully embellished on occasion by additional instrumentation, is a perfect vehicle for Harper’s reflections and his legendary tenor is like honey, still able to take you away to a place where the breeze gently moves the grass on verdant meadows and where streams babble freely amongst themselves for eternity. Man-Myth is available now through Bella Union. Harper is on tour this week only, but still posts infrequently on his blog. Check it out, it’s good stuff.